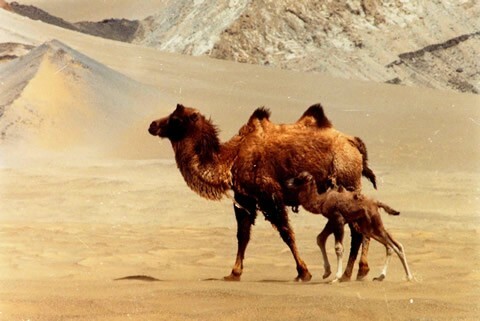 120 years ago, wild double-humped camels which survive in the Gobi desert on salt water with a higher content of salt than sea-water, were found across the deserts and steppes of southern Mongolia, north-west China and Kazakhstan. Unfortunately, years of persecution have reduced the species to less than 1000, split into four fragmented populations, one of which is in Mongolia. The Red Book Listed species, hunted for their meat and hide over the centuries, continue to be persecuted as food for illegal miners, targets for a burgeoning wolf population and are victims of land degradation and poisoning by mining interests.